I get some mockery of my speed of de-rigging and vanishing from events (particularly after forgetting my sail in Devon at the Nationals) but it is the flip side of trying to make the rigging process as easy and fast as possible. The points below came from cruising with the previous Classic rig, wanting as much time as possible on the water, and rigging single-handedly. I hope now to have the current boat ready to take down to the water�s edge around 45 minutes from driving up. 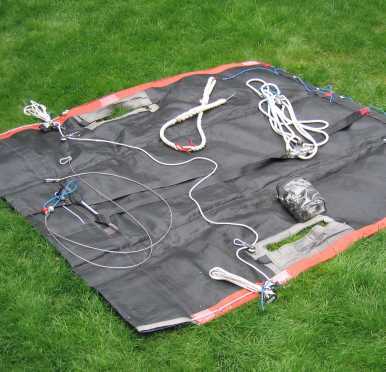 I came to this gradually, starting with the need to tie up the shroud tackle ropes tightly to stop the blocks �flipping� and tangling the lines. 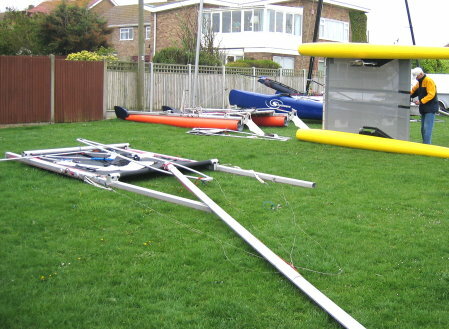 It was then logical to tie them tightly in a bundle on each side of the trampoline, at the position they are on the boat, and to leave the mast heel line running across the trampoline in the sailing position. This is one example of �packaging�, with the double aim of having things already in place to minimise trips to the car, and of avoiding sorting out tangles. Tipping the boat to rig the topmast has always seemed the most awkward part of the process. As well as the ease of fitting the mast together on the ground, another bonus is being able to set up the twin halliards, tied tautly, ready to raise the sail, without extra unwinding after the mast is up, gazing into the sky. Whichever way the mast is rigged up, it seems easier to set it up before the hulls are in place. Tipping the boat over to rig the topmast in the usual way must also be easier with the frame only. 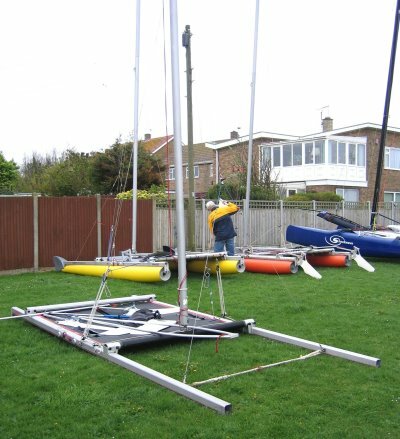 The other rigging aid is a sprayed on, as Halford�s Silicone lubricant along all the bolt ropes--of the sail, of the trampoline (carefully) and of the inflatable hulls. 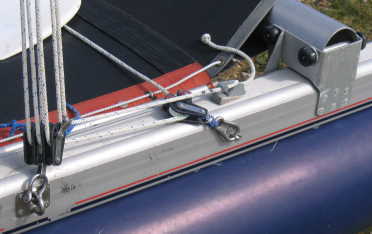 The sail can become too fluid, cascading down as the mast hook is released. Left: Shroud tensioning. As seen, I have repositioned the mast heel line to cross the trampoline forward, to avoid catching and tripping it. The tail is held in a clam cleat---releasing this allows a foot or so of movement, to give sufficient slack to rig. It is straightforward to mark the setup positions at the cam and clam cleats. As the photo left shows, it produces something which looks more like a concept than a boat. I think there must be an instinct to make a "boat" before rigging it, so doing it in this order is still a minority approach, like pointing out that the earth is not flat. Another piece of packaging is having the halliards wound onto a 1 metre frame, to tie onto the topmast for travelling. There are small gains in time elsewhere. I have replaced the sail head shackle with a hook (for its 2 minutes of use each day, safely under a load when going up). At the foot of the mast where the halyard turns around the roller to be pulled up, I successively added to the diameter of the roller, and then cannibalised a ball bearing block (with balls jumping around the garage at times) to give free running. An expensive small gain is from captive-pin shackles for the shrouds and trapeze, and similarly it seemed worthwhile to get a somewhat oversized sailbag made up quickly by Dolphin to speed use.